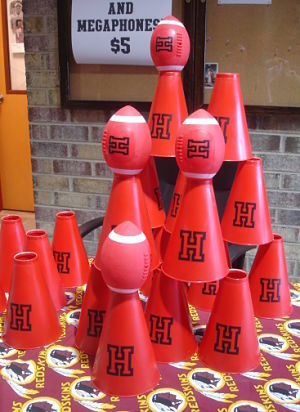 Megaphones and footballs made an appearance at a sports-themed school auction. I’ve said this a thousand times in the last seven years: The quicker you can start to think about your nonprofit or school auction as a business, the faster your auction will grow. And as your auction receives proper TLC, you’ll be looking for ways to add additional revenue to nurture your growing baby. One revenue stream popular at for-profit enterprises is branded merchandise. Let’s consider how you might adopt this idea. Branded merchandise refers to auction items sold at a flat rate. The logo of the auction gala is on the item, or (if you want to brand the item to your nonprofit or school) the logo of the charity. The merchandise is typically themed to the gala itself. 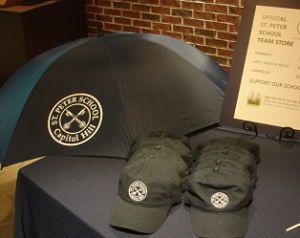 Umbrellas and ballcaps are for sale at this event. The merchandise is typically sold at the auction or in the days immediately before and after it. Consider checking with your auction software provider because it’s typically easy to take orders via your website. Otherwise, apply to the bid number at the auction itself. A vendor who sells giveaways (AKA “tchotchkes”) is going to be able to suggest items in your price point and expected volume. Revenues will vary based on your sales and price point, but a few hundred dollars to the low thousands isn’t uncommon. My advice: Ensure that you’re charging enough to raise the intended amount of money. Factor in all costs: the item itself, marketing expenses, and your “labor” in selling it. Realize that even if labor is free because a volunteer will sell the item at a table in your silent auction, you still have an opportunity cost. Is it better to assign your sales-y volunteer to the table so she can pitch $10 beach towels, or would you raise more money having her selling $100 raffle tickets? The key is to make sure selling these products isn’t more hassle than it’s worth. P.S. Better stuff awaits. Get your FREE subscription to “Benefit Auction Ideas” and enjoy silent auction tips delivered straight to your in-box. Brilliant! as always Sherry. I keep sharing your site with all of my clients and colleagues thinking about or running silent auctions. I especially like the reminder to think about the auction as a business. Good advice. I think this is a great idea. I have branded merchandise from one of my favorite nonprofits and I love it! I wish more would do this.